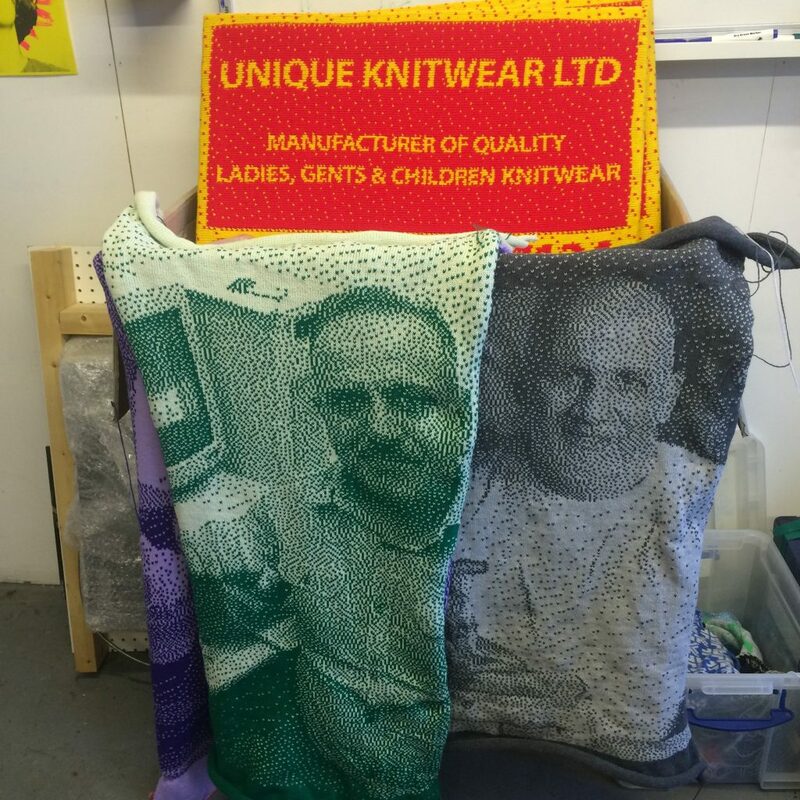 Through interviews and visual research, Sam Meech has developed a series of works in response to and in collaboration with the knitting factories who share Crusader Mill with Rogue Artists Studios. Together they playfully experiment with the traditional artists’ portrait, explore the notion of ‘uniqueness’ in digital art and knitwear production, and propose an internet-age copyleft christmas jumper. 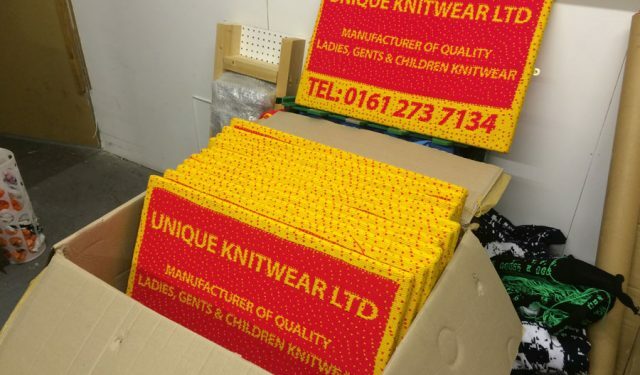 Binary scarves, appropriated patterns and even knitted punchbags, feature in this unusual exhibition of knitted textiles that gives an insight into the factory life and the people who work there. As neighbours to Rogue, businesses such as Dream Knitwear, Imperial Knitwear and Unique Knitwear often cross paths with Rogue artists on the old stairwells of Crusader Mill, but rarely do the communities cross-over. Since April, Sam Meech has been tentatively building relations with the workers and business owners, sharing his own practice and conducting initial visual and technical research into their working environments and manufacturing processes. 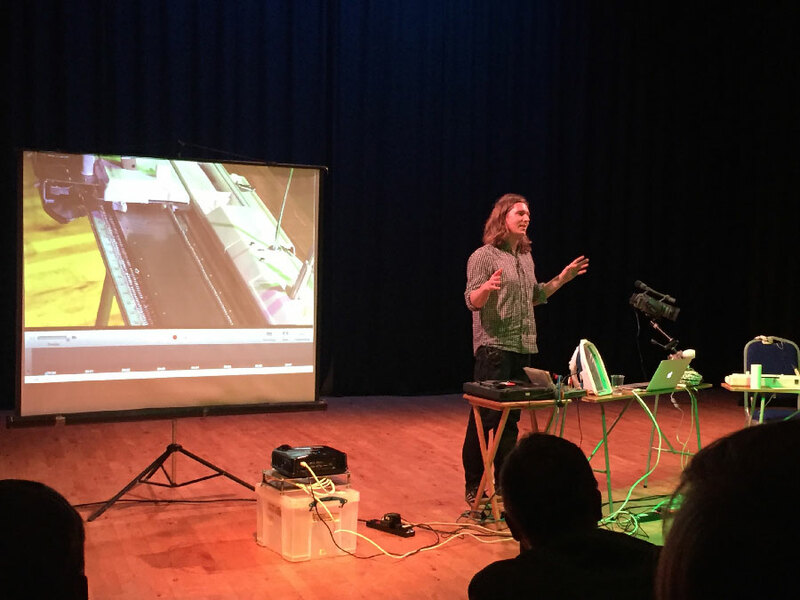 This residency has allowed him to find parallels with his own artistic practice using domestic knitting machines, and also identify opportunities to potentially creatively document their work and experiences, and collaborate in developing new artworks and even new knitwear. Unique Editions #1: Xmas Jumper – Green from Sam Meech on Vimeo. Rogue Project Space is excited to be exhibiting work by Rogue Artists’ Studios (Rogue) members; Jan Chlebik, Hilary Jack, Sam Meech, Evangelia Spiliopoulou, and Mike Chavez-Dawson with Shaw & Shaw at The Manchester Contemporary 2016. I’m really pleased to be respresenting Rogue Artists Studios and Project Space at The Manchester Contemporary art fair this weekend. 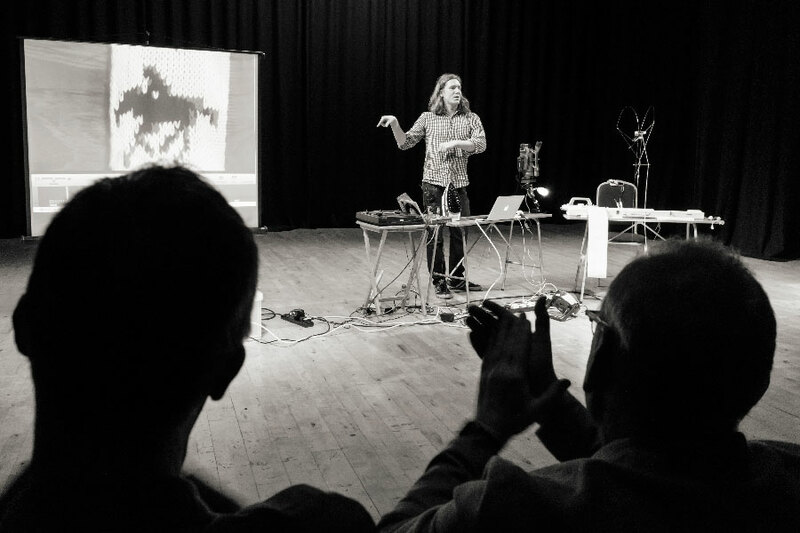 It’s a chance to show some of the work that artists at Rogue develop, and re-state the importance of Rogue in the Manchester art ecology, and indeed the importance of all affordable space for artists in supporting practice. That said, I have some reservations about showing my work in the context of an art market, as I’m not used to exhibiting in order to ‘sell’ work. My experience at Kinetica Art Fair in 2014 was enlightening, though financially costly (£566 on materials, travel, acoomodation and stall fixtures), and only emphasised to me that on the whole I do not make things for market, but instead survive through the commission itself, or more often sharing the process through workshops. The truth is, I am no craftsman, and I cannot make things that are good enough to sell; instead I make works that exist to prompt an idea or question, usually in a specific context. At Kinetica I tried to approach this by offering my artistic labour for sale – an idea that many people felt was conceptually engaging (one chap said that my work was “the closest thing I’ve seen to art in here”), but which failed to translate into any actual bookings for me to ‘work’. This time round, I have decided to look at the notion of value again, but this time questioning the value and originality of the art object in the context of the Art Fair. 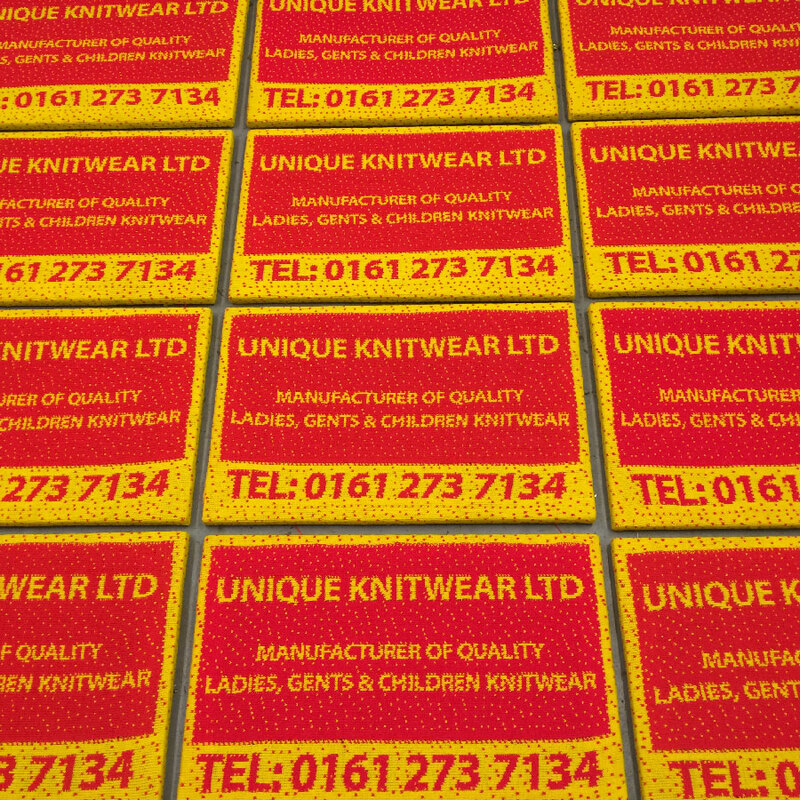 I have produced a number of knitted copies of the UNIQUE KNITWEAR LTD sign belonging to our Rogue neighbours at Crusader Mill. Each sign is exactly the same (bar mistakes and dropped stitches), and is part of an ‘unlimited’ edition. They are essentially stock – no one sign is special, there is no ‘series’. I can knock these out whenever I like. I have also priced them based on measurable variables – materials, overheads, and of course, labour, plus a 20% agency fee for Rogue. It is a practical and economic approach to an absurd environment in which value is often ascribed and opaque. Racing Cars – They Shoot Horses Don’t They? 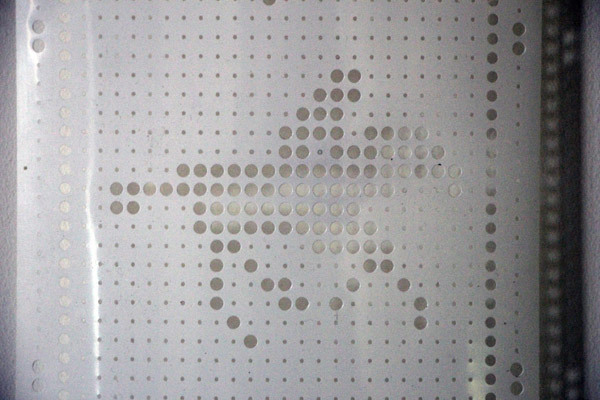 My Knitted Horse Firework film is exhibiting at Waterside Arts Centre in Sale from Sat 23 July – Sat 22 October, along with some great work by other artists at Rogue Artists’ studios. It is part of an annual show by Rogue at the venue (and could be the last one, considering the current situation with ur home at Crusader Mill. 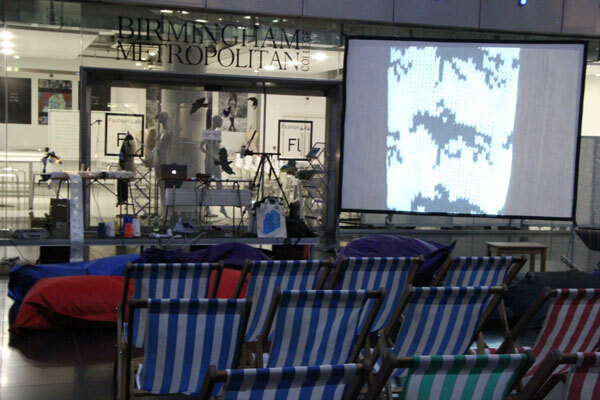 I will also also be doing a live knitting performance on the the preview night (Friday 22nd July), attempting to knit and animate the Horse in Motion film from scratch. 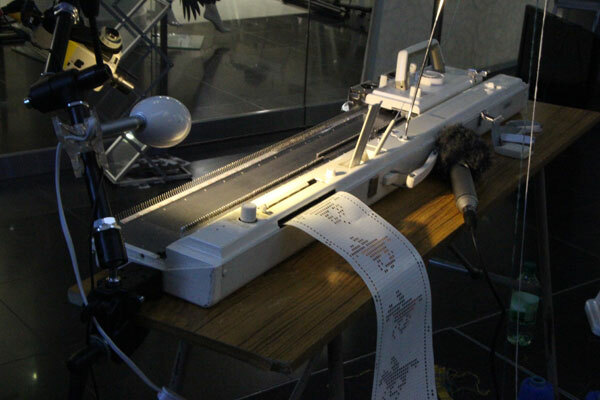 The Open Data Institute, London presents a new ‘Data As Culture’ show – THINKING OUT LOUD, inspired by the way modern and traditional crafts are built with code. 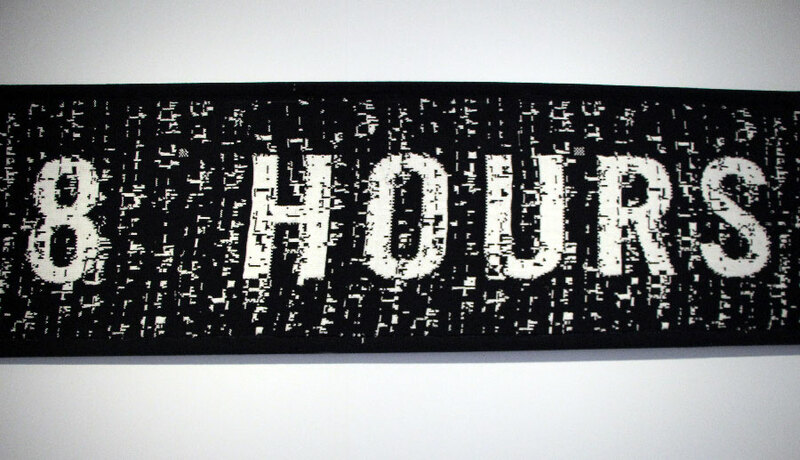 My previous work ‘8 Hours Labour’ has been re-presented as part of the show, and this time features an invition to buy my ‘work’. 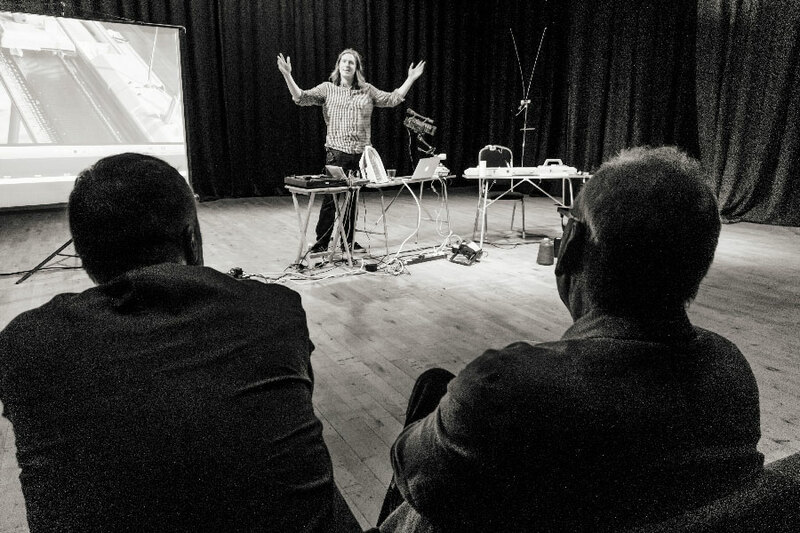 Thinking Out Loud centres around musician, programmer and ODI Sound Artist in Residence, Alex McLean – made possible through a partnership with Sound and Music, through their Embedded artist residency programme – as well as ten of his collaborators. 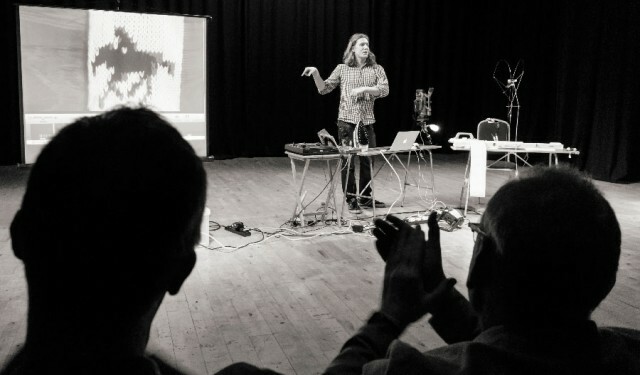 The works explore the ways in which humans have captured and encoded data throughout history, from the ancient art of weaving, and Inca quipu (a recording method using knotted strings) to live coding, and hacking woollen jumpers. The exhibition is interactive, ever-changing and radical, and includes artists who rarely exhibit in gallery environments. There are some brilliant artists from the fields of both programming and craft, some of whom I’ve been lucky enough to meet before. Since my 8 Hours Labour banner already resided in the ODI HQ, I was asked it it might formally be included in the show, as it also explores similar themes of how data and digital tools might inform traditional craftworks. 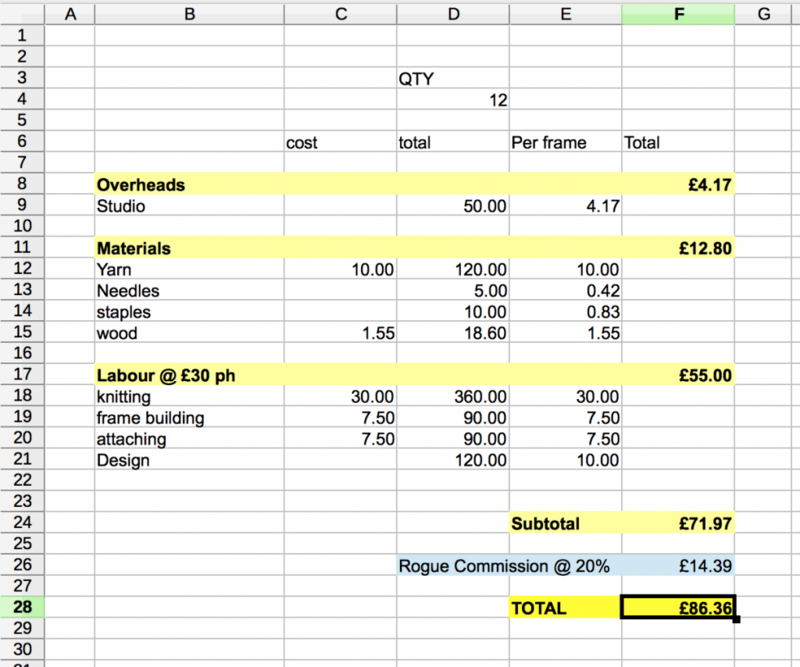 I decided to use the opportunity to also present the extension of the work – ‘Rates For The Job‘ – an invitation to buy my labour rather than my ‘work’. 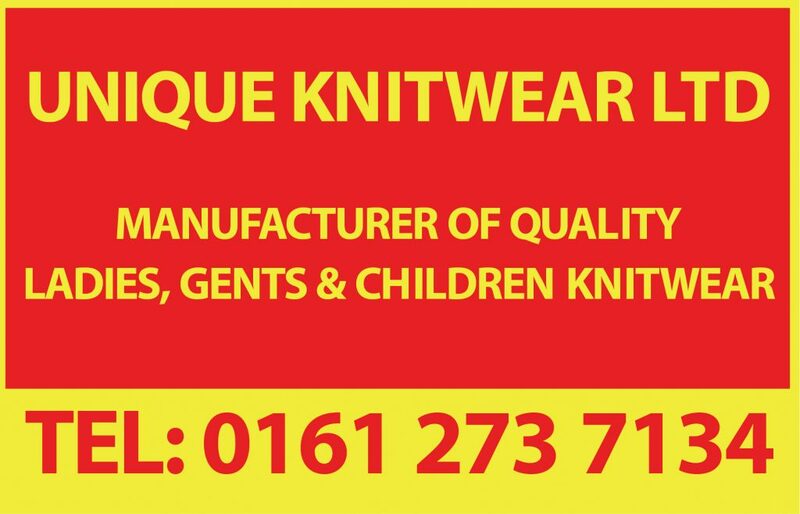 A detailed Purchase Order / Contract allows people to buy a day of my knitting labour at Arts Council England recommended rates, upon the understanding that they are only buying my artistic work, and not an artwork as object. 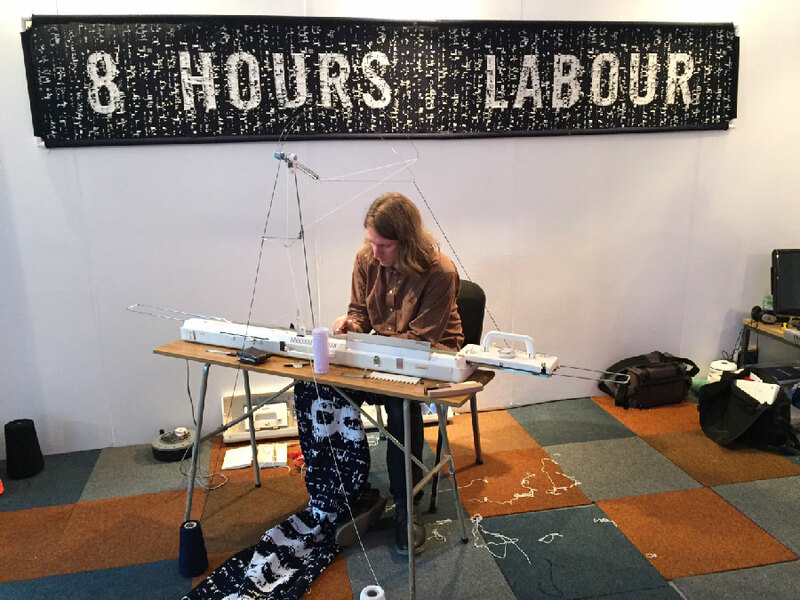 The resulting knitted banner – 8 Hours Labour – serves only as a ‘receipt’ – a proof or document of that labour, and is in itself worth nothing. 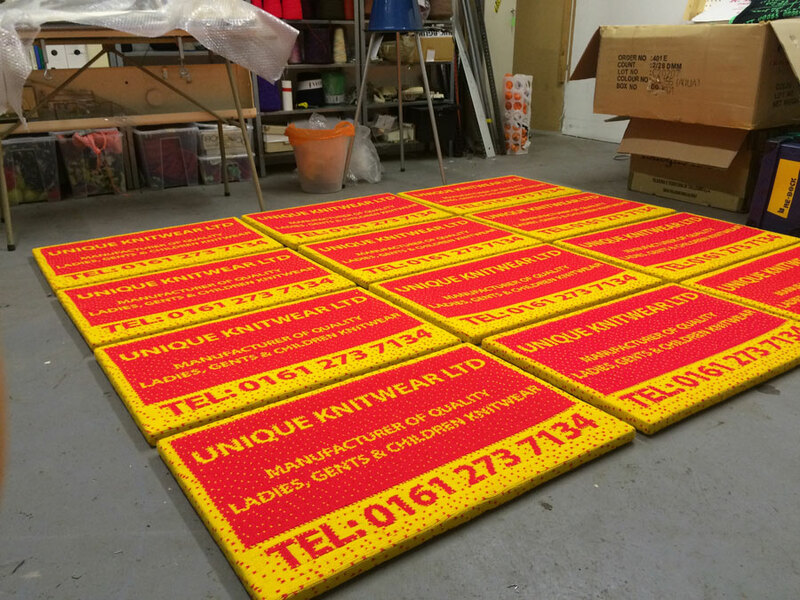 This premise was originally conceived in 2014 when ODI asked me to present the large scale ‘Punchcard Economy’ banner, which was too large to exhibit, and so I resolved to knit a sample of the work – simply ‘8 Hours Labour’. I decided to charge simply for the labour it took to make and package the work – approximately 8 hours. This idea was subsequently presented at Kinetic Art Fair, where again I invited people to buy my labour rather than an art-object. Whilst many people understood and appreciated the idea, unfortunately I left the market without a single order. 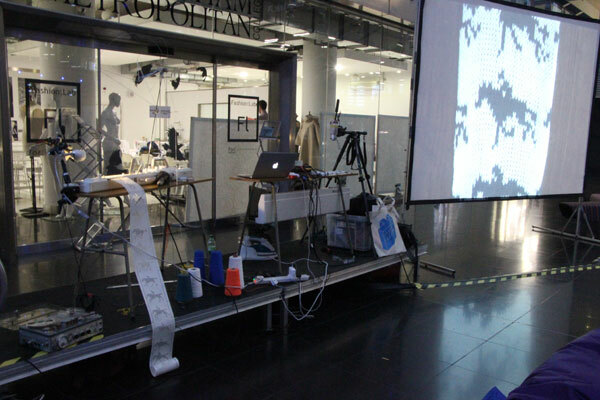 Some pics from last week’s knitting performance at Flatpack Festival. 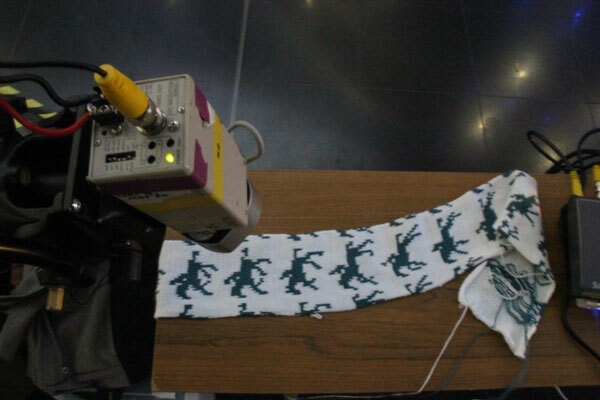 The premise – I knit Muybridge’s horse in motion from scratch, and animate it infront of an audience whilst listening to a soundtrack of 7 inch ‘horse’ singles. This is only the third time I’ve performed the piece, and im pleased to say it worked this time (thats 2:1 so far). Final animation below. 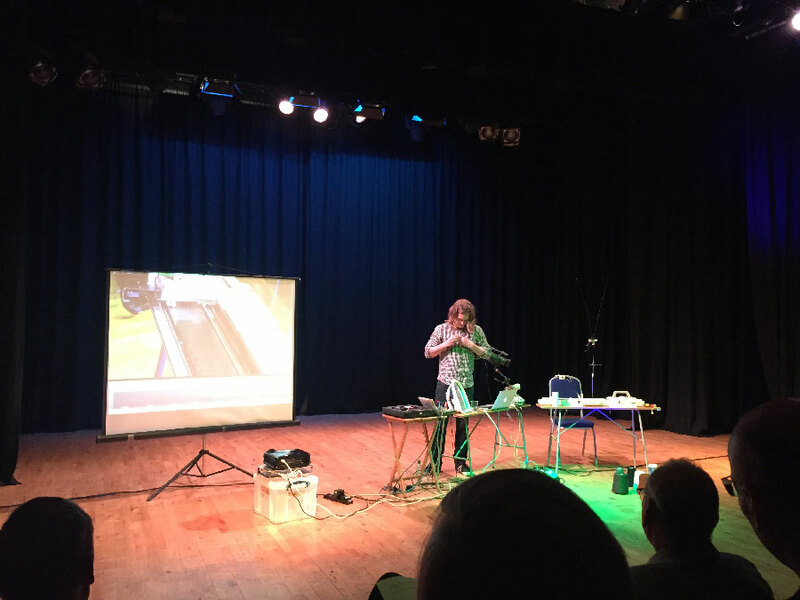 Many thanks to Reuben from Sculpture (who were absolutely amazing performers in their later set) for handling the horse tunes. 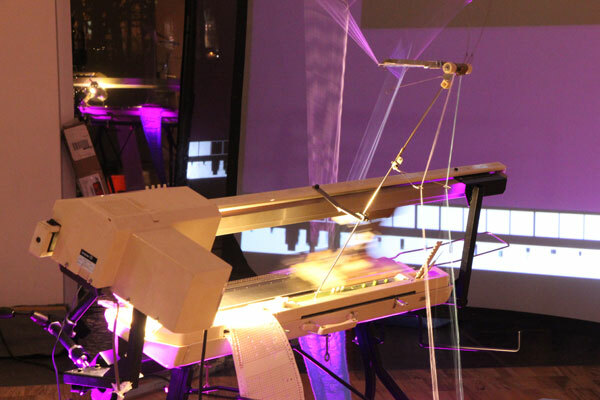 Pictures from the KNIT RGB DISCO punchcard installation at the Whitworth Gallery, Manchester, 5th March 2015. 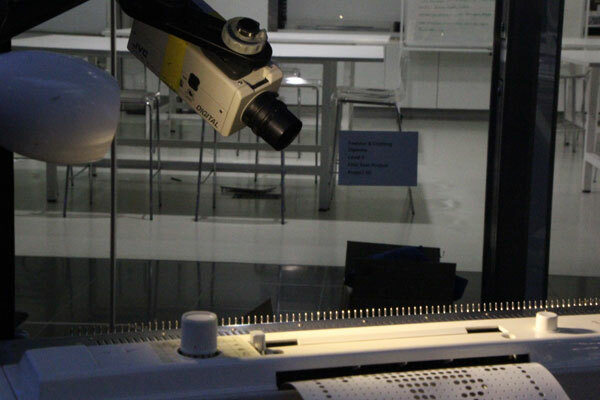 The principle is to read each 24 cell punchcard row as a set of binary values. 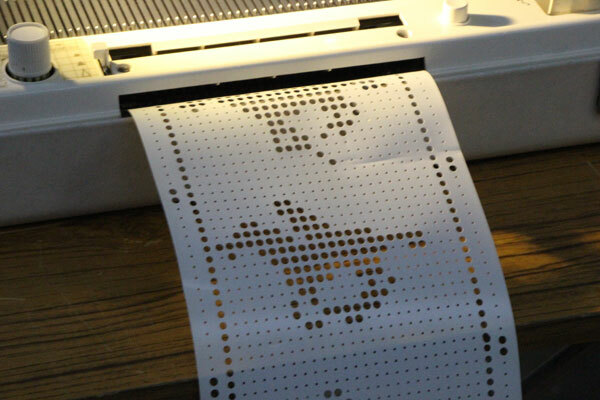 Since 8 binary values can create a total of 255, it means each punchcard row can provide three sets of values ranging from 0-255 – essentially providing any RGB web colour. These values are tracked and sent to the projector and colour changing LED lights, creating a system in which the design impetus is not so much create a knit pattern as to programme the colour space of the room. 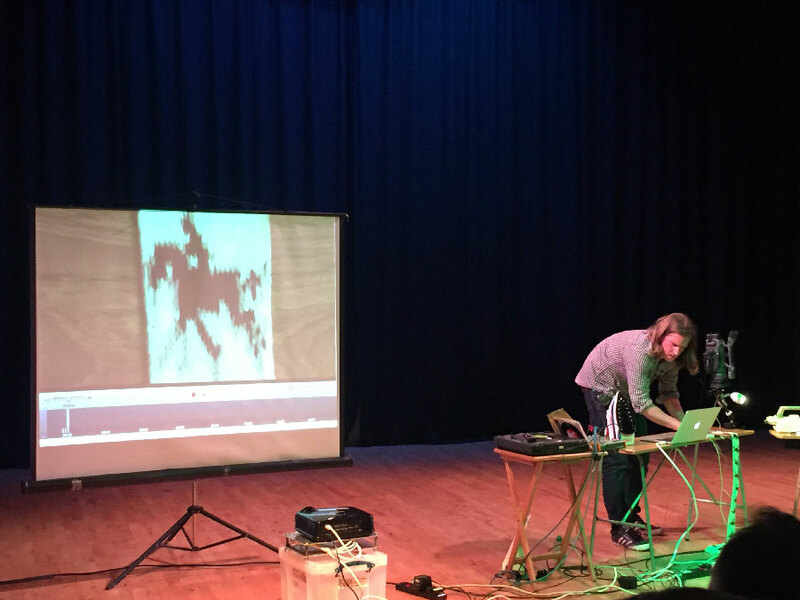 As well as using the binary values to control colour, for this iteration I am also experimenting with ways to cue sound samples, as well as record and remix sound generated by the knitting machine. This provides the ‘disco’ element. 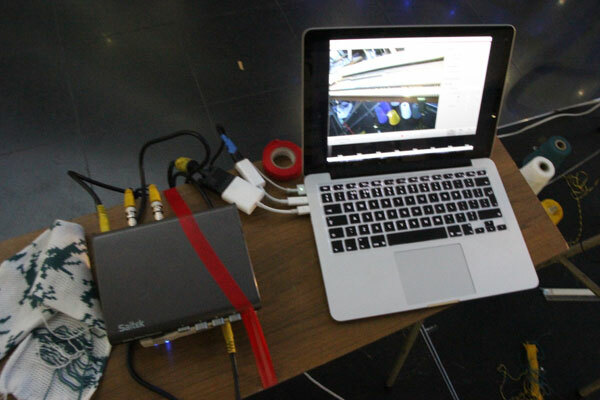 Again, all this is done using the Isadora visual programming environment. 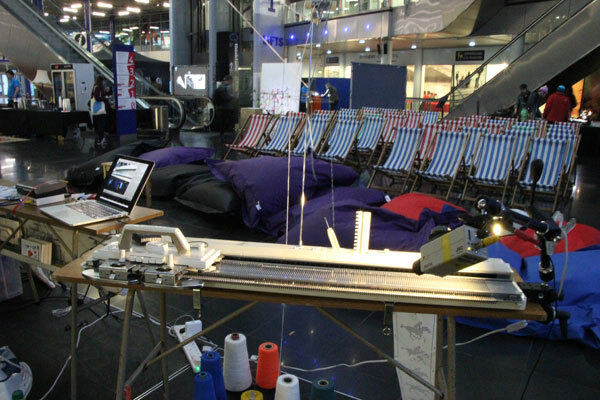 Knit RGB Disco v1 – Whitworth Gallery from Sam Meech on Vimeo.